Two-and a-half words that, said aloud in a cocktail party, mean very little to much of the crowd. Show the same people a postcard with Tuscany written in Monotype Corsiva across the bottom and the room would probably fill with the more appropriate ooohs and ahhhs befitting of a first glance at Val d’Orcia. The moral of this storiella (little story, in Italian) is that what people imagine in their heads when you tell them about Tuscany, the pictures and paintings that immediately come to mind, is in fact, the landscape of Val d’Orcia- its rolling emerald hills swathed in golden light, the cypress trees reaching up to the heavens, and the perfectly-placed hilltop towns dotting the horizon. The valley is a UNESCO World Heritage Site and its claims-to-fame include the towns of Pienza, Montepulciano, and Montalcino. Taking a tour with CIAOFLORENCE last year introduced me to all three, conveniently departing by bus from Florence. This particular Val d’Orcia tour, offered by CIAOFLORENCE, is a bang for your buck; not only does it include a guided tour of all three Tuscan towns, it also incorporates two wine tastings and a cheese tasting. I hate to keep name-dropping but you might recognize these VIPs of the foodie world which will be gracing your palate throughout the day: Vino Nobile, Brunello, and Pecorino. Could you really ask for anything more? Your first stop after escaping the tourist hoards in Florence is Montalcino, the home of Rosso di Montalcino and its more-esteemed older sibling- Brunello di Montalcino, considered by many to be one of the world’s best wines and constantly rolling off the lips and into the mouths of wine experts and amateurs alike along with the other “B words” like Bordeaux, Barolo, and Barbaresco. 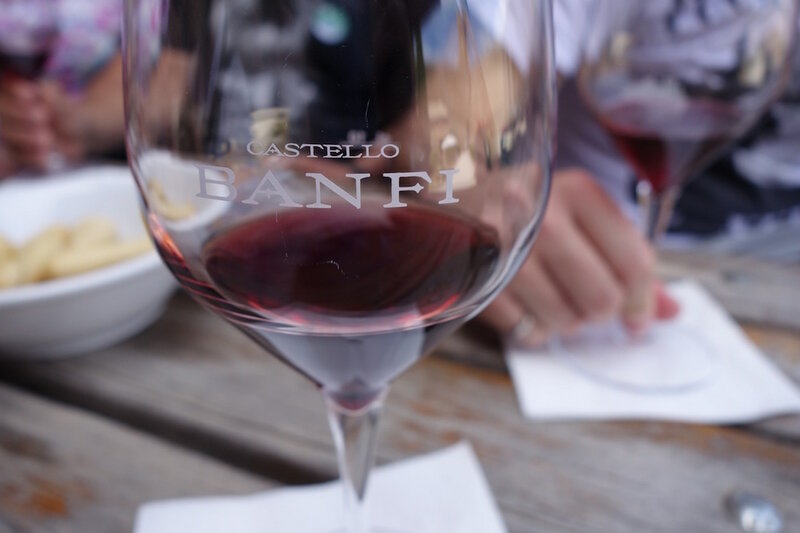 Montalcino is a small village, a welcome introduction to the tour as you’ll be able to take a quick peruse around its castle followed by a tasting of Brunello in the most felicitous setting possible: in the courtyard, right under the shadow of the castle itself. You’ll be kicking back like a true queen (or king) and sipping a wine worthy of your newfound royal status. 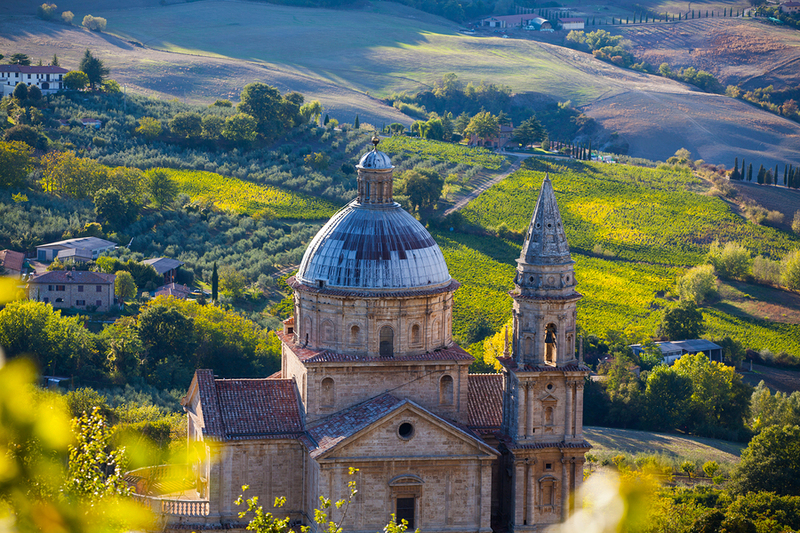 After walking off your morning buzz, you’ll hop back on the bus to weave through the morning sunshine to your next destination: paradise on earth, also known as Pienza. I’m fairly certain that Pienza can’t possibly be a real town. It’s like something out of books or film, a town so perfect in its miniscule details that it could only be created by the most romantic of hearts. The views from the hilltop town are spectacular as they overlook the entire Val d’Orcia, offering a postcard panorama that you won’t be able to take your eyes off. Feel free to linger for minutes or hours, although not too long unless you want to miss your tour departure. I wouldn’t blame you though. Also feel free to really take in anything that you find beautiful (including the aesthetically-blessed Italians that call this country home); if there’s one part of Italian culture that deserves a round of applause, it’s the universal appreciation for beauty of all kinds. The streets are cobblestone and the city seems to be eternally bathed in watercolor washes of what most people might describe as beiges and sands, but to the poets and painters among us, might be more aptly described as a hodgepodge of ochre, sienna, and umber- as if someone tried desperately to capture the fading Tuscan sunset in the buildings.Looking out on the valley provides contrast when the town is at your back, in the summers it’s a vivid sea of emerald green spotted with trademark trees such as the Stone Pine and of course, the Italian Cypress. Your tour includes a brief introduction to and tasting of Pienza’s famed pecorino cheese. Pecorino is made from the milk of the luckiest sheep in the world which explains why it tastes so good. These spoiled sheep don’t know they’re living in a painting and leisurely spend their days literally “under the Tuscan sun” munching the wild grasses, clover, and even absinthe as I discovered after reading a New York Times piece on the topic. 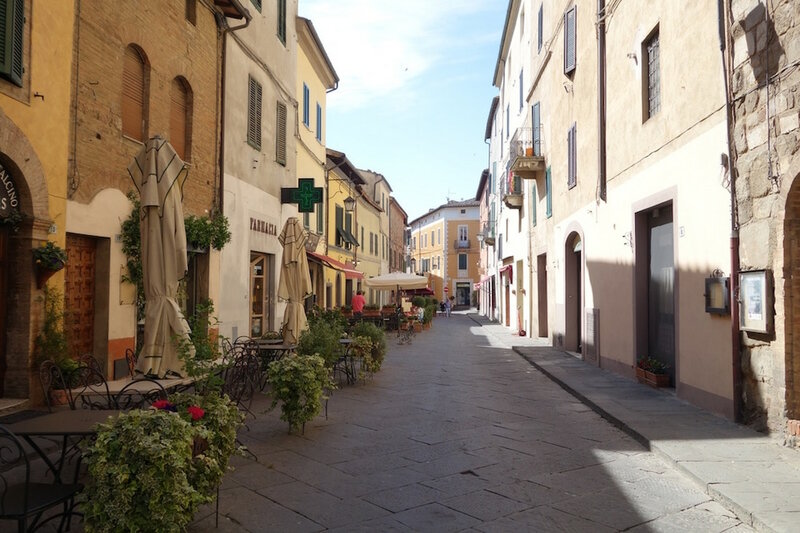 Your final stop (if you can manage to utter “arrivederci Pienza”), is Montepulciano. Wine enthusiasts will be revving their engines at this point and for good reason, although the less-studied might not have heard the name before. Unfortunately this is due to the so-called Super Tuscans like our friend Brunello from the first stop, that often steal the spotlight. 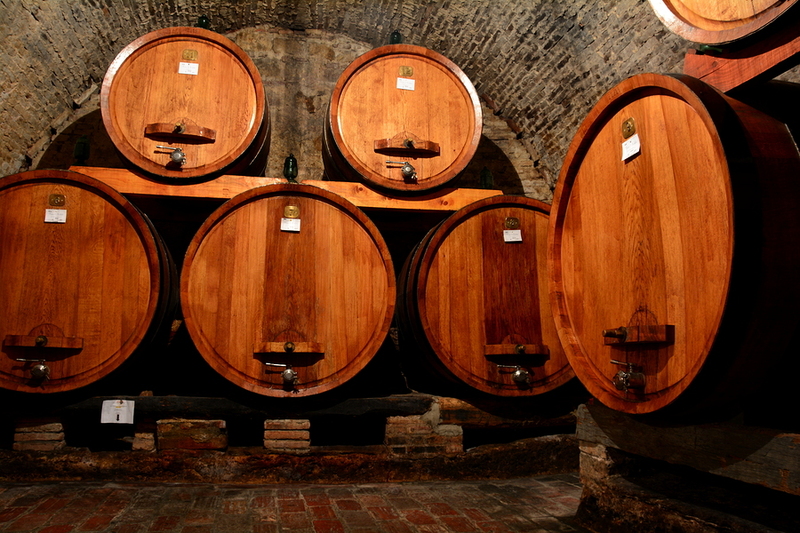 Montelpulciano is home to Vino Nobile, the name is already telling you just how good it is- it originated as a wine for nobles to drink and is actually made from Sangiovese grapes, not Montepulciano grapes like Montepulciano d’Abruzzo. I highly advise you purchase a bottle for future dinner parties and delight your guests with these little-known facts as they salivate over your Tuscany vacation scrapbook. The main piazza is called Piazza Grandeand functions as a true gathering place for both locals and tourists. 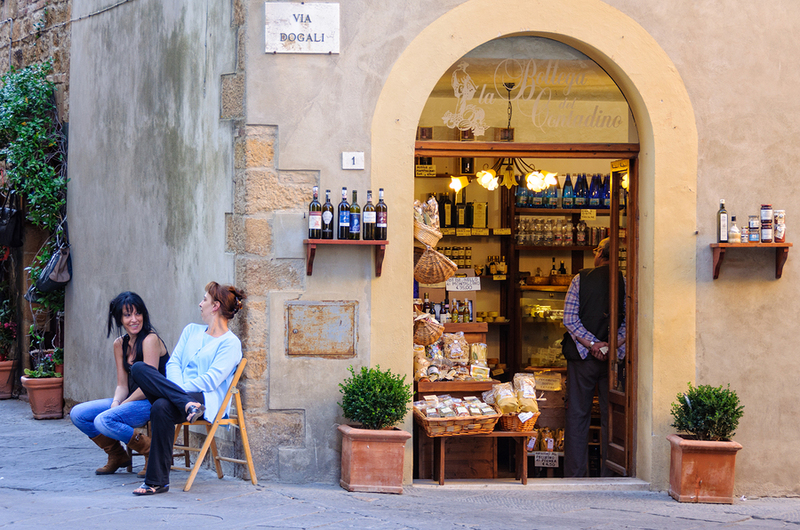 I would tell you to enjoy an aperitivo sat on a chair amidst the hum of the dolce vita toscana but inconvenient as it may be, your tour includes a wine-tasting of Montepulciano di Rosso and Vino Nobile. On my particular tour, we were guests at Fattoria della Talosa where you can check out an ancient Etruscan tomb located underneath the winery before settling in for a glass…or two! If Florence is your departure point, this tour has you back in the city in time for your dinner reservations which is sheer perfection if such a thing existed. Admittedly, Tuscany comes pretty close. If you manage to keep your red wine buzz going all day just know that there’s nothing quite like the Ponte Vecchio, sunset, and just a touch of Tuscan reds running through your veins. USEFUL INFO: This is a 12-hour group tour that costs 70 Euros and includes all your transportation in a mini-bus or bus, 2 wine tastings, a pecorino tasting, and an extremely informed guide (ours was tri-lingual). As with many Italian towns, the streets and the slopes make your choice of footwear the most important decision of your day- be sure to wear something comfortable or risk “achy, breaky” feet or worse, toppling over in Piazza Grande and making a brutta figura.